Have you ever had one of those special moments when you experience something that makes a lasting impression? Did it seem dream-like or like a scene from a movie? Do you often replay it in your mind? Did a beer ever invoke one of these magical moments? It can happen?!? In the small medieval town of Brugge, Belgium, is a smallish pub with a very large reputation, at least among cerevisaphiles. 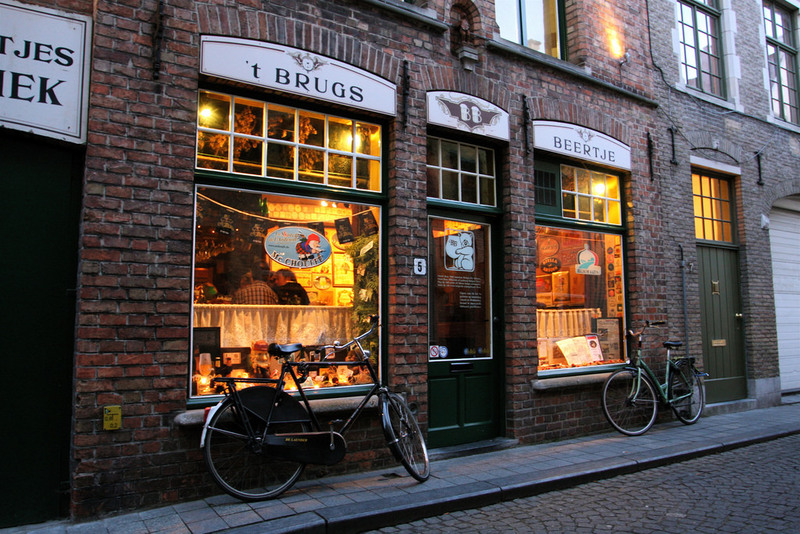 The t’Brugs Beertje is down a narrow side street in the old part of town. It boasts a beer list of over 250 beers! A small group of beer aficionados found themselves in the back room of the t’Brugs Beertje one dizzily spring evening drying out, discussing the events of the day’s activities of site seeing and beer tasting and looking forward to another new beer experience. One of the group, a beer judge and sometime beer writer, thought to divert from the usual fair of lambics, triples and trappist ales and order something different. The choice made from the beer list was an oud bruin. These are dark malty complex beers whose brewing history goes back for hundreds of years. It’s not a style that the usual American goes to Belgium to experience. The barman comes to take order. Swallowing his pride and exposing his ignorance, our friend asks, “which of these oud bruins is the best”? With his best look of pity for the clueless tourist, the barman retorts “sweet or sour”? Okay, a quick answer is required here so that he doesn’t blow his cover completely. “Sweet”, he says with all the bravado he can muster. “Very good then, Ichtengem’s it is”, says the bartender as he turns on a heel and disappears into the cellar. The others order such favorites as Chimay Blue, Bell-Vue Kriek, Gulden Draak and a Rochefort 8. The server returns with the brown ale. Affecting a look not unlike that of a diamond cutter about to cut the Hope, he pours the beer into its glass. Belgian bartenders all celebrate this ceremony for every beer they pour with great solemnity and purpose. The bottle and glass are held at eye level, the glass tilted to 45°, the neck of the bottle 2.54 centimeters above the rim of the glass. Eyes focused on the on the beer its poured down the side of the glass producing a perfect, white, rocky head over the dark reddish brown brew. He places the glass on the table as if it was the Holy Grail and arranges the bottle so that the label is properly presented to the patron. With a nod of his head he is gone. So this is an oud bruin. He recalls the style guidelines for his training. It’s supposed to be rich, malty and complex. Some are tart or sour as are many Belgian ales and they have a fruitiness from esters and from fermenting on berries. Lifting the glass and inhaling deeply, our hero is greeted with that multiple Belgian yeast character along with malty sweetness and esters. “Oh boy”, slips from his lips in a surprised whisper. The first sip, an ample draw, brings the confirmation of the malt sweetness balanced by the sourness on which Belgian ales have made their reputation. The profile is reminiscent of a trappist ale with notes of lambic. His thought was of the first Westvlettern 8 he experienced on his last trip to Belgium. Looking around to see if anyone noticed his total loss of cool, the analytical side of his brain took over. Was this just realized expectation or was this really that good? One way to find out weather or not he was “reading into it” was to offer a taste to an friend who has no such preconception. “ Jana, would you like a taste of this one?” The friendly offer was cheerfully accepted. A smell, a sip and then the show repeated itself. No need for words, the story was written on her face. First concentration, then a smile, then darting eyes; her face registering every nuance of the changing flavors and lastly a “Wow”. Amazing! His thoughts confirmed, he turns back to that magic bottle and lets it weave its spell. The fact that oud bruins are as good as they are is no accident. They were first brewed in the 1600’s as a “provision beer”; a higher alcohol beer that would travel well in the hold of ships. The oud or old in the name refers to the type of yeast, ale, which is the old way compared to the use of lager yeast. Oud bruins brewed today are not as big as their forefathers are. They average around 5.5% ABV with Duchesse de Bourgogne, one of the biggest, at around 6.2%. They still maintain the sweetness and rich fruity flavors of old. Belgian beers, styles are often hard to pigeonhole. Some sources list oud bruin as Flemish Red ale or Flemish brown ale or by the more general term Belgian sour ale. Oud bruin is a brown ale and it does have added fruit, which makes it a red but the color is not the defining characteristic. The difference between red and brown ales is regional terminology. The “red ale” name probably came from Rodenbach, a clear, red oud bruin made with lighter grains and fermented on cherries. Even though it’s clear and red, it’s still in the character of the old browns. The differences are fewer than the similarities. Ichtegem’s Oud Bruin, the example our friend tried, is a rich dark brown but the flavor profile is similar. Blending is the key to the complex flavor of the oud bruins. Brewers blend young and well-aged beers to produce a more mellow the beer. The big malt character tends to sour a bit as it ages which makes the older beers quite tart. The young beers are still malty sweet when blended. For example, Ichtegem’s is a blend of 30% old to 70% young beer. Old browns are made with Munich and Vienna malts with smaller amounts of crystal malts, fermented with ale yeast and lambic-like microflora. This produces a very “Belgian” flavor profile. Long boils account for much of the color along with the crystal malts and dark candy sugars. The soft water of the region balances the acidity of the dark malts and reduces the lactic sourness a bit to produce a beer that is wonderfully balanced for all of its complexity. The base flavor is malty, with fruity complexity and some caramelization characteristics. A slight sourness may be present with some sherry-like flavors and some oak character may be present in well-aged examples. Aromas are usually malty, tart, fruity and floral, but clean of diacetyl and no hop aroma is evident. They exhibit good clarity with average to good head retention. Other examples are Oud Zottergem’s, slightly tart, with a bready sweetness, Liefman’s Goudenband, more tart than sweet, and Rodenbach Grand Cru, which is very tart, clean and fruity. These should not be confused with Dutch oud bruins, which are low alcohol malty session beers. Nor should they be confused with Belgian brown ales like Gould Carlus or Kasteel Brown which are huge beers with a distilled spirits character and very sweet. That being said, Oud bruins can vary quite a bit from any official style guide. Belgian brewers are based in tradition but the Belgian tradition allows for a great deal of innovation. There are many good examples of the old browns, each one different from the next. Each one an experience worth your time. Maybe you won’t have a magical experience when you try your first oud bruin (old brown) ale. The style forged over the years by those wonderful Belgian brewers will have you in its spell.